Every gemstone has its own set of rituals and methods for wearing, which are to be followed with care so as to derive maximum astrological benefits from it. Pearl is a pure and pious gemstone, which is linked with the planet Moon and is used to make it positive and auspicious for the wearer. This soft organic pearl gemstone is known to bring peace and calmness to the person who wears it in a ring or pendant. First of all, the person who wants to wear a pearl ring should consult a learned astrologer to check out whether the stone is suitable for him, according to his horoscope. Additionally, be sure to adorn a good grade pearl stone for full benefits. It is best to opt for South Sea Pearls. For this, you need to get a pearl ring online from a trusted seller like 9Gem.com. A pearl which measures 5 to 10 carats is considered to be the most favorable one. The weight of the pearl stone should not be less than 2 Rattis. The best period to purchase a pearl stone is a Monday, which falls in the Shukla Paksha (ascending cycle of the Moon). The ideal configurations (Nakshatras) for this purpose are Rohini, Pushya, Shravana or Hasta. The most suitable metal for setting a pearl stone in a ring is silver. 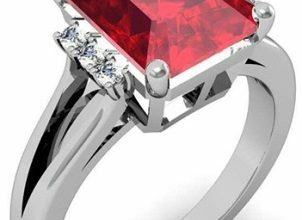 It should be made in such a way that the stone touches your skin and transmits the cosmic energies through direct contact with the physical body of the wearer. Pearl ring is to be worn on the little finger of the right hand. Before you wear the ring, you need to energize and purify the pearl stone by dipping it in raw cow milk and then washing it with the Gangajal. After doing so, the wearer should chant the following mantra of the Moon 108 times and then put on the pearl ring in the correct finger. 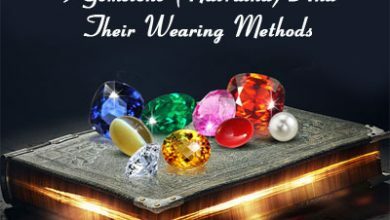 After wearing the ring, the native should donate items such as sugar, rice, wheat, cloth and money to a Brahmin to enhance the positivity of the pearl stone. The unique stone pearl is a source of fascination, on account of the fact that it is formed within a living organism and is used in its natural form, without cutting or polishing. Its astrological benefits are equally astonishing, provided that it is worn adopting the correct method and rituals. These rituals are of vital importance as they help release positive vibrations of the gemstone, making it more effective. Besides wearing it in a ring, you can also wear a pearl pendant for excellent results. The wearer can experience multifold benefits of wearing this delicate and amazing gemstone pearl. Note: If you still not able to find a solution to your problem. Let us know about the problem. Write below in the comment section about the question or query you have in your mind about astrological gemstones. Peal and emerald are 2 different stones with different effects on person. Always wear stone in the right finger as suggested by your astrologer. The pearl which you are selling is akora pearl or freshwater pearl? If its a freshwater pearl then do u sell akora pearl as well? We are dealing with fresh water and south sea pearl stones. We are not dealing in akora pearl stones. is it ok to wear pearl in gold ring?? Please check the blog carefully for the answer is given in the blog. Sometime astrologers recommend as per the birth chart readings. So please confirm with the astrologer if possible. pearl n Monga can wear together?? Pearl on small finger and Monga on ring finger?? Please check the blog carefully. Everything is given. Can I wear pearl and emerald ring together? Check your birth-chart from expert astrologer before wearing any stone if you are looking for astrological results..
i am been told to wear a pearl ring in gold in the left index finger can you please tell me what is the benefit of the same? Is it necessary to wear only on Monday?? Not mandatory but do as per the direction from your astrologer. Please consult with astrologer for this.